Knowing what to say to someone who’s had a miscarriage is really hard. I’ve been reminded of this recently after three wonderful women in our church shared with me the grief and horror of their recent miscarriages. Miscarriages, and infertility more generally, are really hard topics to talk about because they’re deeply personal by nature which means that sometimes people aren’t ready to share their struggle. And when someone is hurting or confused, our quick-fix comments can actually be inadvertently careless and insensitive. Or our desire not to offend means we find it easier to not say anything at all, leaving the women (and men) who are grieving feeling isolated or forgotten in their pain. So, what can we say or how can we love and encourage someone who’s experienced a miscarriage? And how can we bring the beautiful truth of the Bible into these conversations and care? 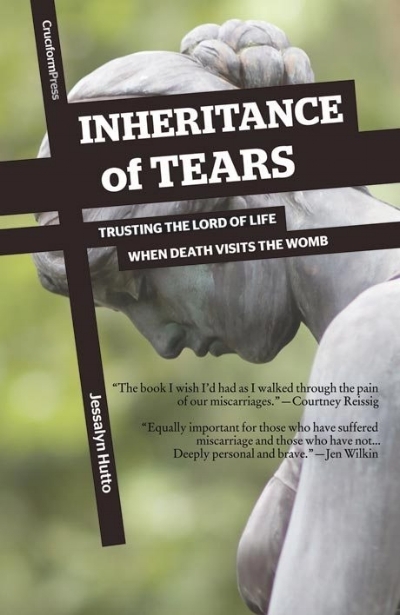 That’s where I found Jessalyn Hutto’s book “Inheritance of Tears: Trusting the Lord of life when death visits the womb” helpful. In this short but sometimes intense book, Hutto speaks from personal experience, losing both her first and fourth babies at different stages of pregnancy. She sets out to address what she calls an “unseen grief”, helping women understand how knowing God in times of pain and suffering can enable women to come out the other side with joy and hope. The book is written particularly to women who have had a miscarriage, and at the end of each chapter Hutto includes a genuine and kind prayer for the suffering mother. I found these words quite emotive and poignant, with a wider application to people suffering other griefs or trials too. The book has five chapters and passages from the Bible and lyrics from Christians hymns and songs are interwoven throughout. Hutto starts by thinking about the question “Why God, why my baby?” and the wider existence of suffering as part of our broken, fallen world. Then she considers what the Bible says of God’s sovereignty, and trusting God’s character even when we don’t understand or agree with his purposes. Having not experienced a miscarriage myself, reading Hutto’s chapter on Our Good Shepherd gave me a much greater appreciation of the invisible pain a woman who has miscarried experiences. It made me stop and pray that my friends would know God’s comfort intimately if they felt any of the isolation, loneliness, fear and anxiety she mentions. Our God truly knows and understands the pain of deep suffering, as he was prepared to die in order to bring his lost sheep back to himself. In chapters four and five Hutto shows us from God’s word that trials and sufferings have a purpose in transforming us to be more like Jesus as we learn to trust him more, helping us look forward to the perfect, wonderful day to come in the new creation where there will be no more death, mourning or pain. I found it encouraging to be reminded anew of the perspective believers should have on suffering and trials in this life, that they are temporary, fading, and preparing us for our eternal, imperishable home. Come Lord Jesus. Taking that into account, I think that this is an important book for all women to read. If you are grieving the loss of a baby or babies or suffering grief of another kind, I hope that this book helps bring you deep comfort and peace in your pain as you look to Jesus as our suffering servant King who truly understands. I do want to acknowledge though that as every woman’s experience will be different, this may be a more helpful book to some than others. Because of its clear presentation of the gospel and reflection on God’s character and Jesus’s death for us, you may find it an appropriate book to give to a non-Christian woman trying to make sense of a miscarriage. And for other women, like myself, who have not experienced this grief firsthand, it helps us think about what others may be feeling, and consider how to love and care for them. I’m thankful that Hutto has been willing to share so honestly and vulnerably about a very difficult period in her life. I hope that as a result we will be better able to care for each other and point each other to the hope of glory we have in Jesus.